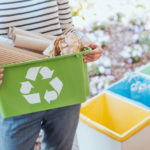 When most people think of going green, they likely think of financially neutral measures like getting a recycling bin. Other ideas include spending money on more expensive (but eco-friendly) things like green cleaners, shampoos, and even food. How many times have you bought something you needed, but only needed it once? Maybe it’s the circular saw for your big woodworking project that you haven’t picked up in years. Or perhaps the snowblower you got for the big storm, but haven’t needed since. 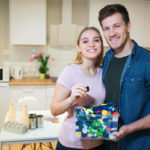 When it comes to items you need but not all the time, Good Housekeeping says you should do your best to rent them. Lots of hardware stores have rental programs. Also, some libraries allow items other than books, CDs, and movies to be checked out. It’s even possible your friends or neighbors have the item you need! So ask around before you buy one. This way, it doesn’t just sit in your closet, gathering dust once you’ve done the occasional job you got it for. Water is one of the most precious resources we have. It’s also one of the most commonly wasted. However, if you install aerators in your sink, as well as a shower head that reduces the flow of water to a lower level, you can make a huge impact on how much goes down the drain in your home. 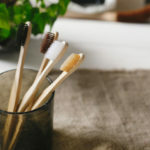 While it might not be much on a daily or monthly basis, this can add up to a lot of saved water over time according to Small Footprint Family. No one wants to go back to hand-washing their laundry, and you don’t have to. But did you know it takes a lot less energy to wash with cold water (Source: Mad Money Monster)? 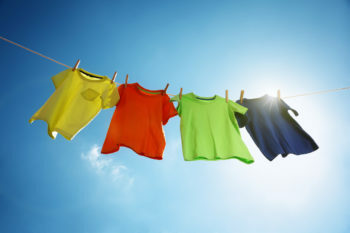 So not only can you save a lot of energy washing with cold water, you can air dry your clothes (with either a whirly-gig or an old-fashioned clothesline) and double your money and energy saved. This is especially useful if you use a coin-operated washing machine and don’t want to spring for the spin dry. We all know you should leave your curtains open as long as you can to utilize your home’s natural light. Yet, the sun always goes down eventually. Instead of replacing your burned-out bulb with whatever you have in your closet, make sure you get a pack of efficient light bulbs. LED lights are the most efficient, use a fraction of the energy of standard light bulbs, and they can last for several years. They’re a bit of an up-front investment, however, they can make a big difference over their lifetime. Most of us know we can’t just toss our old cell phones in the garbage. They need to be properly recycled, just like other electronics. Now, if you follow Good Housekeeping‘s advice, you can trade your old electronics in for a spot of profit! This keeps your old electronics in circulation, ensures you’re not wasting space in your home, and everyone comes out a winner! 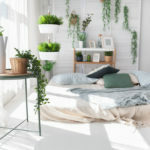 These are just a few green living tips you can implement that complement your go green lifestyle. For more simple things you can do to live a more frugal, greener life, simply contact us today!